When the Hudson’s Bay Company built a new store in the new city of Vancouver in 1887, they hedged their bets on the location. It wasn’t in the rapidly establishing replacement for Granville – ‘Old Granville Township’ around Carrall and Water Street, where the 1870s fledgling city had grown, only to be destroyed by fire in 1886. But it also wasn’t on the rival centre being developed by the Canadian Pacific Railway on Granville Street, running from the CPR Terminal to the new hotel, way off in the recently cleared bush. The Bay executives split the difference and put their new store roughly halfway between the two rivals, on Cordova Street. If there’s any indication of which side they might favour in the tug of war between the two developing centres it might be indicated by their choice of designer – T C Sorby, also responsible for the design of the Hotel Vancouver. The building he gave them wouldn’t have looked out of place on any prosperous English High Street. That shouldn’t be surprising; Yorkshire-born Sorby arrived in Canada in the early 1880s and by the time he reached Vancouver in 1886 he was already 50, with a long career already behind him in England. Here’s how the new store looked in 1888 in a VPL photo. The Bay didn’t stay in this location for very long. In 1892 C O Wickenden was hired to build a new store on Granville Street – confirming the company commitment to the CPR’s part of town. They still ran the Cordova store until 1894, and in 1895 Beaty and Hall had replaced them, greengrocer and produce merchants. In 1901 there was a druggist here, with a cigar store in the other half of the building. Eventually the building was swallowed up in the ever-expanding Woodward’s store, replaced recently with the 43 storey tower of the Woodwards redevelopment. In 1888 well-connected American architect Bruce Price designed the New York Block on Granville Street. It was one of a series of fancy new office buildings the Canadian Pacific Railway commissioned for their land holdings, particularly along Granville Street. The New York Block was in the 600 block of Granville, just down the hill from the Donald Smith Block, also designed by Price, and the CPR’s Hotel Vancouver. In 1889 it was valued at $25,000, and was faced and trimmed with granite, described by the Daily World as “certainly the grandest building of its kind yet erected here, or for that matter in the Dominion”. You can see that in 1889 even grand buildings still had plank sidewalks and uneven streets in front. The ‘Canadian Builder and Architect’ identified the developer: Sir George Stephen, a founding member of the CP Rail backers, and a prominent Canadian businessman. Originally from Scotland, he made his fame in Montreal and was the first Canadian to be elevated to the Peerage of the United Kingdom. Bruce Price’s residential designs were important enough to influence Frank Lloyd Wright, particularly his designs in a New York planned suburb, Tuxedo Park. His early designs for hotels and stations for the CPR established the château style they continued to reference for decades. Among others, Price designed the Château Frontenac in Quebec and the Banff Springs Hotel. In New York, as in Vancouver, he favoured the Richardson Romanesque style, although in New York (where his office was based) he soon moved on to skyscrapers in a classical style. 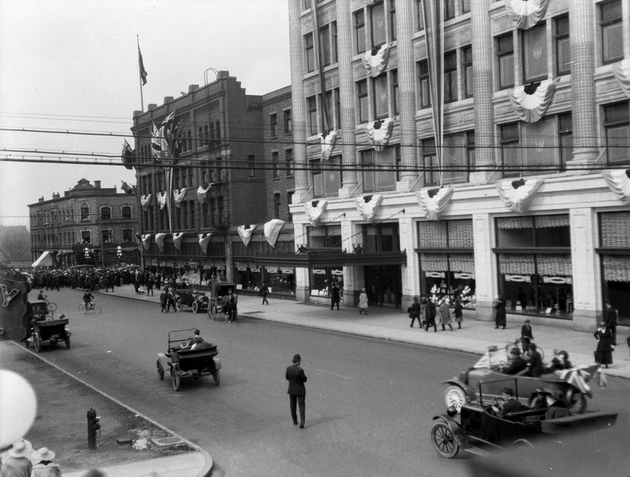 The building lasted about 25 years, replaced in the early 1920s with the current Hudson’s Bay store. We’ve already shown in another post how the first Hudson’s Bay store was added to in 1914, and then the first store was replaced with this second phase of construction. The contemporary image shows the new glazed canopies that replace the heavier steel design that was in place until 2012. This is one of the earliest houses built in the city, in the newly cleared CPR land one block off Granville Street where they were developing their hotel and office buildings to create their new city centre away from Gastown. We know a fair bit about it because the owner’s daughter gave a detailed interview to Major Matthews, who recorded it in the early City Archives. “We remained at Yale, and then came on to Vancouver in Father’s railway car, September 3rd , 1887, and lived in it for about ten days on a siding at the foot of Granville Street until our house, 455 Seymour Street, west side, close to Georgia Street, and now part of the site of the Hudson’s Bay store, was completed. Father had started to build before the Fire; the lumber was on the ground, but the fire destroyed the lumber; it had to be replaced. The family stayed in the house for three years, then moved to a new house on Beach Avenue. (Note that 455 later became 677 Seymour Street). The House stood until 1912, and must have been bought by the Hudson’s Bay Company as it is where they built the first phase of the existing building in 1913. 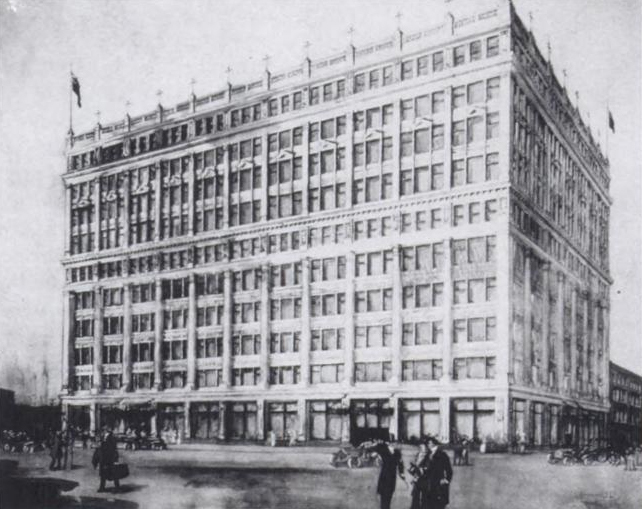 (The first Hudson’s Bay store was in Gastown, and the second at Georgia and Granville. The expansion in 1913 was on Seymour, and then the second building was demolished and replaced to match the Seymour building in 1925. 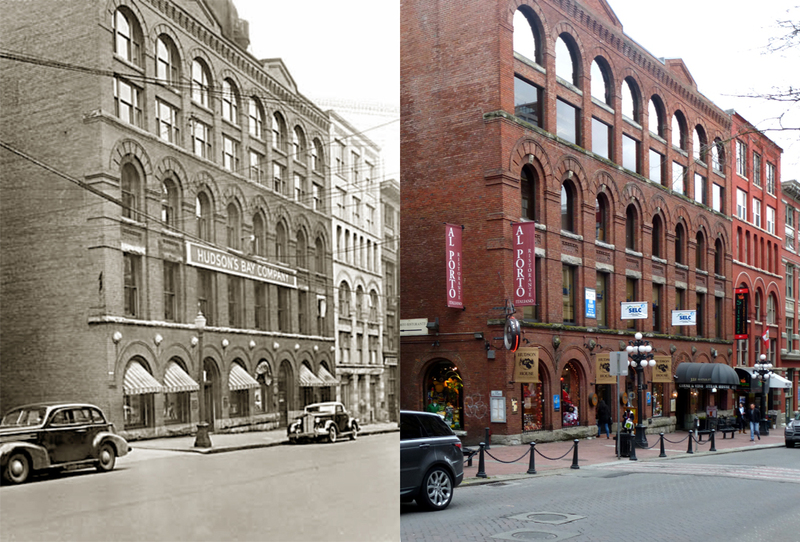 For a while both the 1893 building and the 1913 building stood side by side as the 1917 image on the right shows). The architects were Burke, Horwood & White and the contractors Rourke, MacDonald & Moncreiff, and the first Seymour and Georgia phase of the construction cost $900,000. The architects were from Toronto, and specialised in designing large commercial buildings using historic styles but contemporary materials (favouring glazed terra-cotta, steel frames and fireproof construction methods). Although it was considered a new technique, the building had a reinforced concrete frame rather than steel (which had to be shipped from the east at considerable cost). Although a substantial building, at six storeys, the design included the possibility of an additional four storeys at a later date. The design in part referenced Chicago architect Daniel Burnham’s store in London for American retailer Gordon Selfridge. This has been called a ‘decorated warehouse’ – which is in a sense what all the big departmental stores have been from that point on. The Vancouver design was deemed so successful other Hudson’s Bay stores were designed in the same style, starting with Calgary (which actually completed ahead of Vancouver) and Victoria. Recent restoration of the terra-cotta, and the removal of a solid metal canopy with lightweight glazed weather protection have given the newly revitalised Bay building a new lease of life. Here’s a shot of the 600 block of Granville Street from the corner with West Georgia seen in a 1906 Vancouver Public Library image. The traffic is still driving on the left, and way down at the end of the street you can see the Canadian Pacific station buildings. The 500 block had a variety of businesses, including some apartments just up the hill from Pender Street, the First Church of Christ Christian Science Hall and the Bank of Montreal. The 600 block had offices occupied by several physicians, the Grotto Billiard Hall, the Simpson Block with a baker and confectioner, the Seattle Rooms and the New York Block (a very early office building developed by CP Director Sir George Stephen, and designed by New York architect Bruce Price). There were offices of tea and liquor merchants and Frances Carter-Cotton of the News-Advertiser, and closest to us the Hudson’s Bay Company store. The store was built in 1892 and designed by C O Wickenden, but it only lasted to 1925 when it was demolished and replaced by the terra-cotta covered design still there today, designed by Burke, Horwood and White. The first phase of the current building had been built in 1912 on the Seymour and Georgia corner. The rest of the block today contains The Hudson, a massive condo building with over 400 suites and some retail space below, designed by Stantec Architecture. It incorporates the facades of the 1892 Hunter Brothers block and the BC Electric Showroom by Hodgson and Simmonds from 1928.